These bull-nosed edges are quite popular in new homes these days. 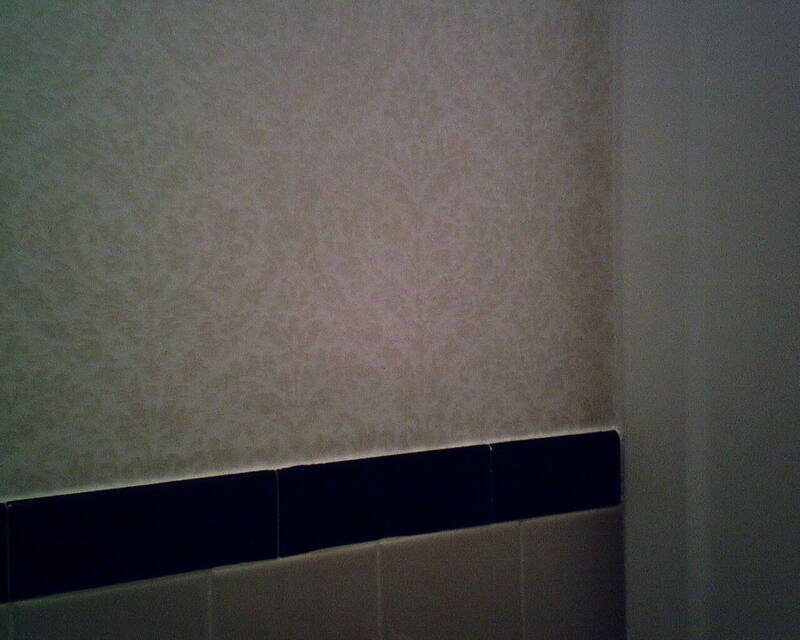 When the wallpaper is to end on an edge like this, they are hard enough to trim on, because you can’t tell exactly WHERE the edge is, because the strip of paper is flopping over the wall. 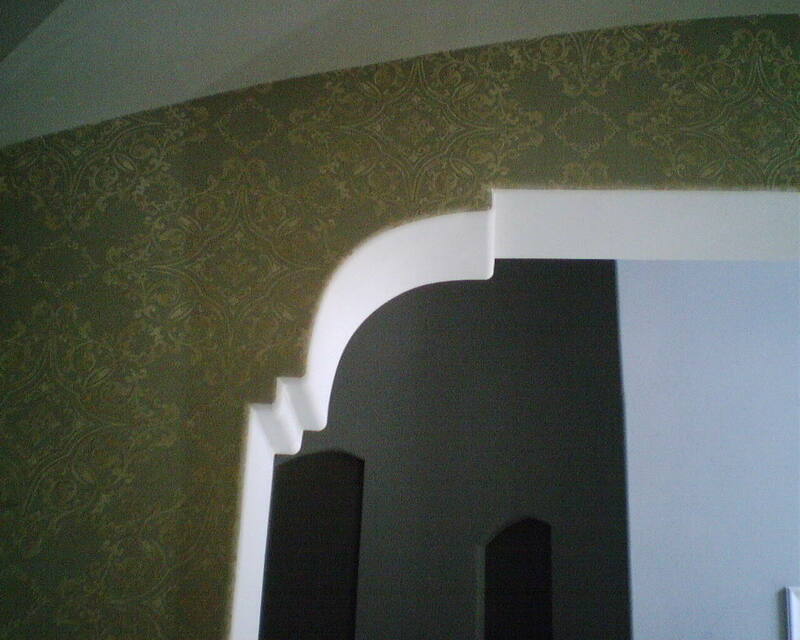 The difficulty of this job was compounded by the additional angles in the arch. But I have a little gadget that helps get good straight cuts on these bull nosed edges. I spent at least three hours on just this wall, but, as you can see, it turned out great. This wallpaper is by Designer Wallpapers, and has a little glitter, plus a bit of a raised texture that feels something like velvet. I hung it in a dinging room in a new home in Bellaire. This paper was bought at a discounted price from Dorota Hartwig at Southwestern Paint on Bissonnet near Kirby. (713) 520-6262 or dorotasouthwestern@hotmail.com. Discuss your project and make an appointment before heading over to see her. There was just enough left over paper for me to remove and replace two full length strips, one on either side of the door, and one above the door. (A good reminder as to why it’s always a good idea to order a little more paper than you need.) I wanted to remove the damaged paper, rather than go over it, to eliminate a double-thickness of paper, that would be quite noticeable along the full length of the 8′ seam. 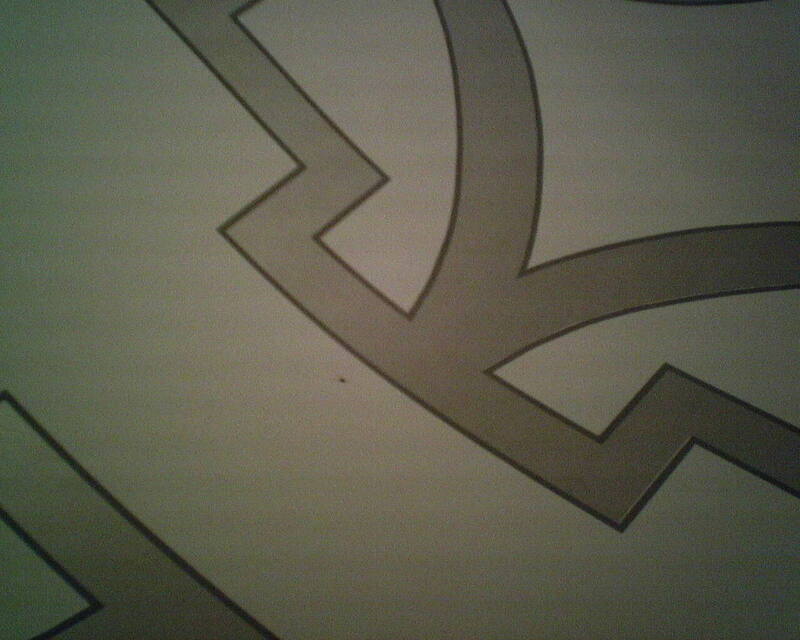 This paper is on the newish “non-woven” substrate, which is made to come off the wall easily and in one piece. 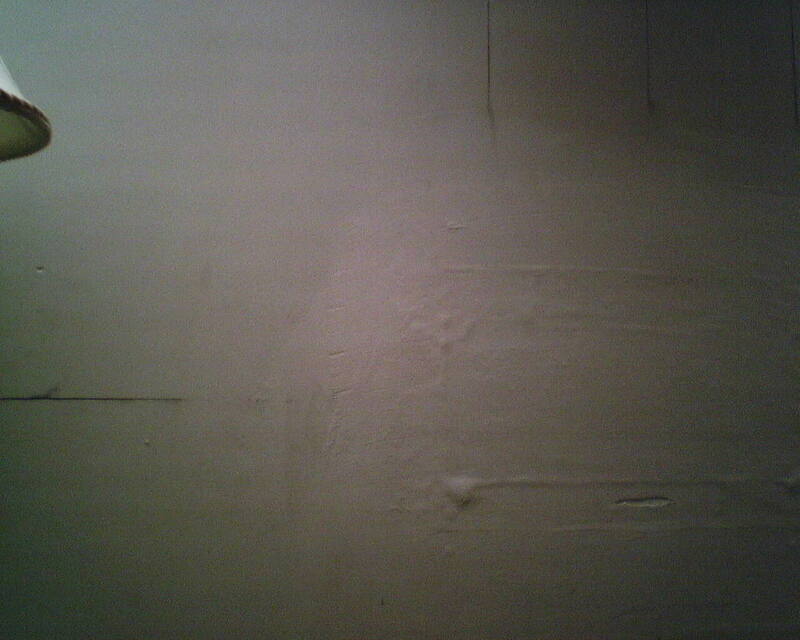 It did – and, thanks to my wonderful primer KILZ Original, the wall is still perfectly intact. However, I was not able to remove the paper over the door, where the workmen had made their patch. 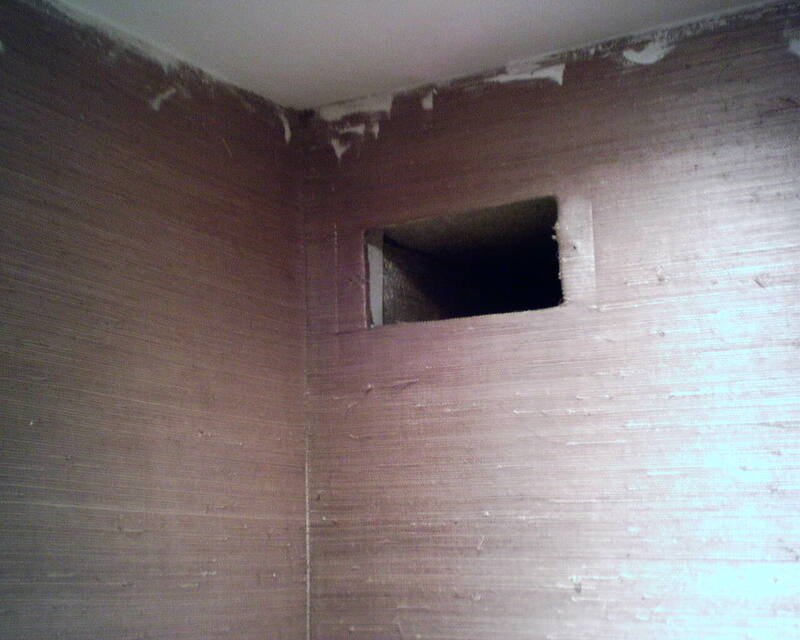 At first, I tried digging under the patch, but it quickly became clear that that would create a bigger mess, and possibly compromise the wall structure, so I decided to cut around the existing wallpaper and leave their patch in place. 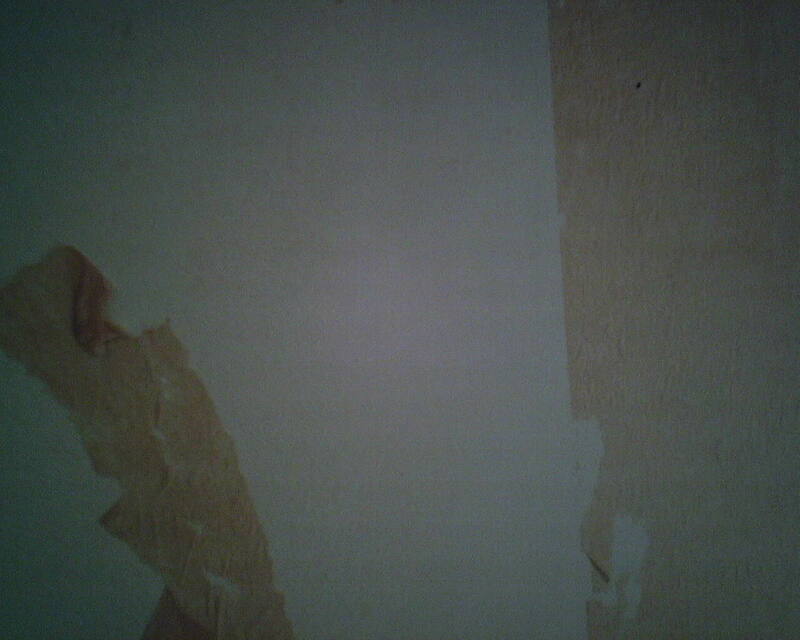 However, that left a height difference between their patched area and the bare wall from which I had stripped the old paper, which would leave a noticeable hump under the new wallpaper. So I “floated it out” to even up the area as best as possible, waited overnight for it to dry, sanded it smooth, primed, and was finally ready to hang. Sorry, no pics of the workmen’s patch or of my patch over that. In the first photo, you see where the two strips on either side of the door have been removed, as well as the piece over the door, and my smooth patch. In the second photo, the two pieces on either side of the door have been put into place. 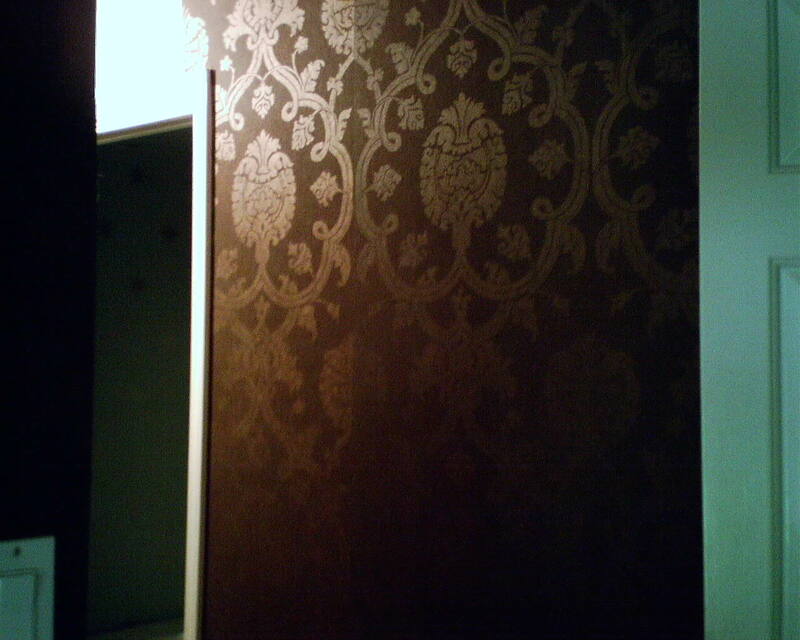 In the third photo, the final piece of wallpaper is in place. What is cool about this is, this is actually pretty tricky. 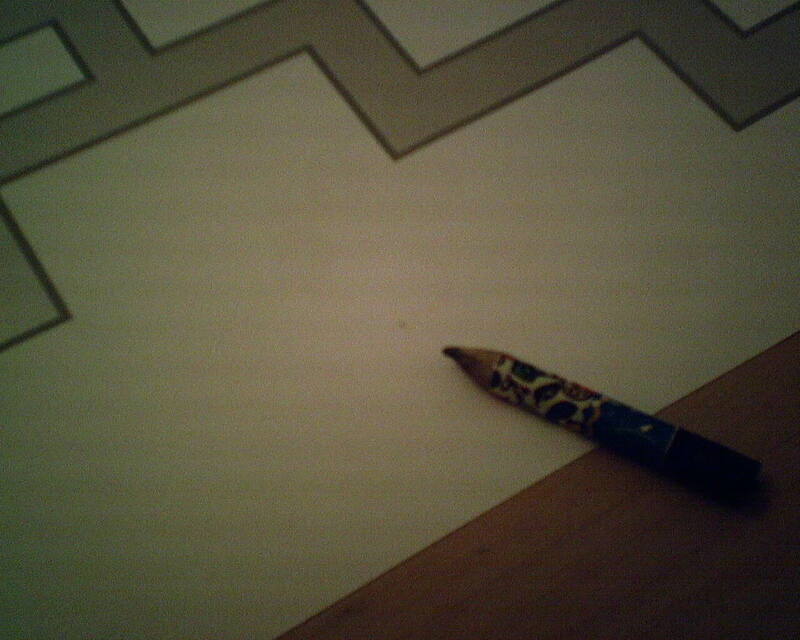 With a regular wallpaper, it’s difficult to put new paper in the middle of existing paper, because, once wallpaper is pasted, it absorbs the paste, and moisture from the paste, and expands, and the rate of expansion can vary. What that means is, a new piece you want to put in between two other pieces may not fit exactly, because it could expand to a wider or narrower width than the original piece. For that reason, I striped the wall under the seam area with dark brown paint, just in case there would be a gap between the new strip and the existing strip. Alternately, the new strip could become wider than the space, necessitating that it be trimmed a hair along one edge. But I was lucky. Because the non-woven material is pretty stable, it usually does not expand or contract much with moisture, so the paste did not effect it. All three strips fit back into the existing space perfectly. This especially surprised me, because my patch over the workmen’s patch created two ever-so-slight humps in the wall over each corner of the door frame, and I feared that the additional height would create a teeny bit of space that the paper could not fill. But it turned out that the paper fit perfectly. Whew! There is one issue, though, as you see in the final photos. The paper that has been on the wall for several years is much darker than the new paper that has been rolled up and packed in a box in the closet. 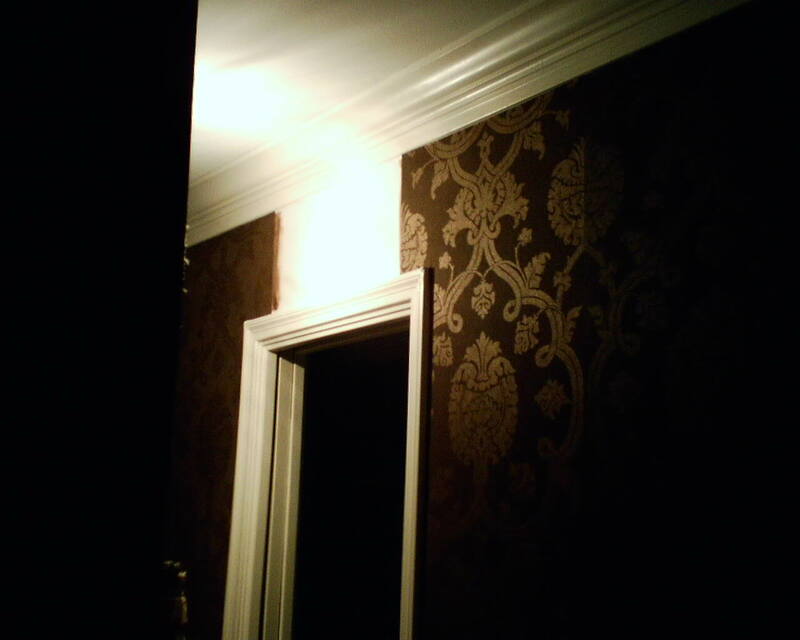 But, once I got my 100 watt light bulb out of there, the room’s one recessed can light was dim enough that you did not notice the color difference. 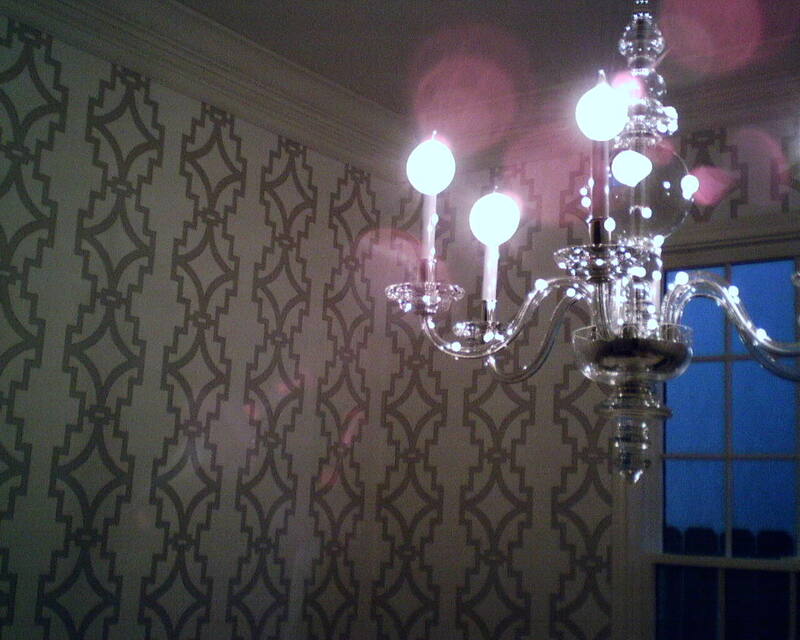 And it’s definitely better than having to replace wallpaper throughout the entire room. 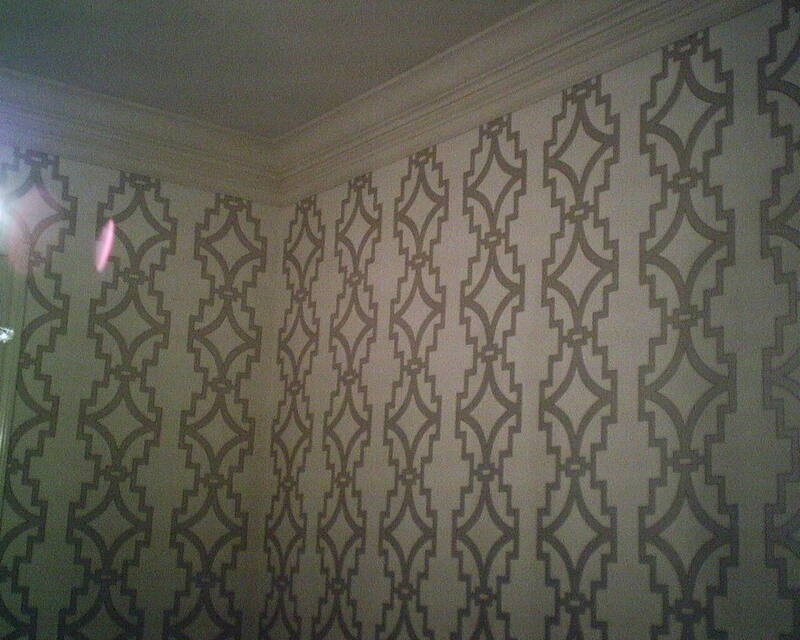 The wallpaper is by Schumacher, and the interior designer is Shirley Webb. She creates beautiful, elegant, yet livable designs (this family has school-aged children), and is a delight to work with. 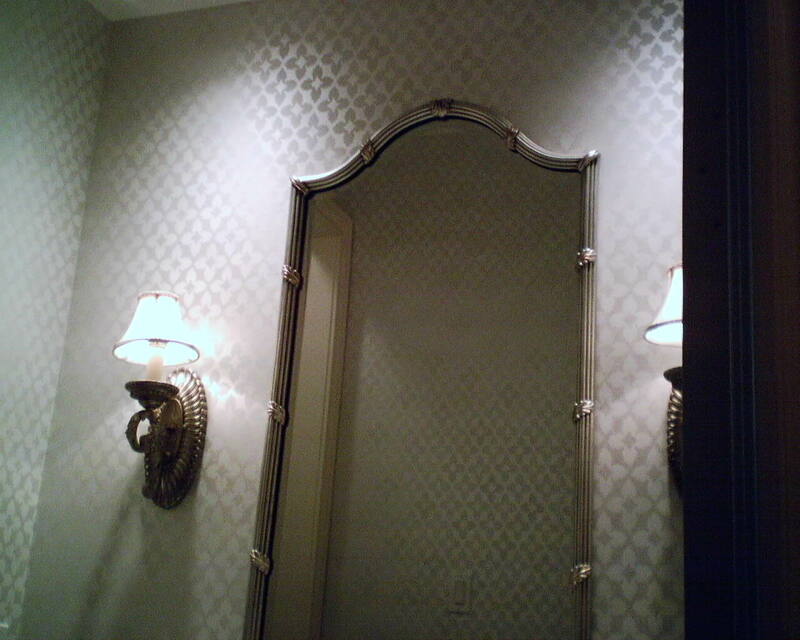 This wallpaper, by Thibaut, had these little black specks and smudges (and other small defects not pictured) here and there, front and back, throughout 22 rolls. 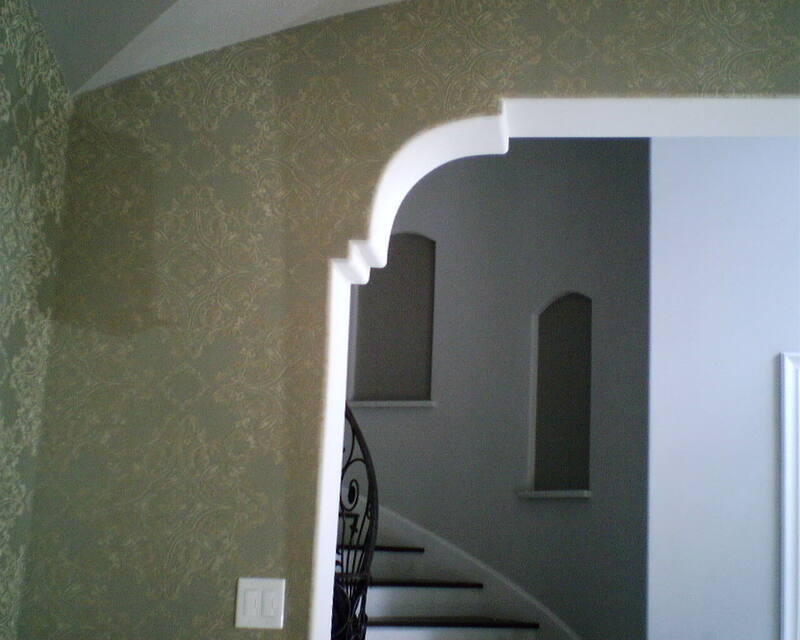 Most were pretty minor, but with such a plain paper, so much white background, and no busy pattern to hide the defects, I did not want to put it up, and the homeowner agreed. So we sent it back. I suspected that all rolls from that run would have the same defect, but there was no other run available, and the homeowner really wanted her dining room finished. So we requested that the company hand-inspect each bolt before shipping out the new paper. Of course, they did miss a good number of specks, but they were pretty minor, and I was able to cut around the bad ones. 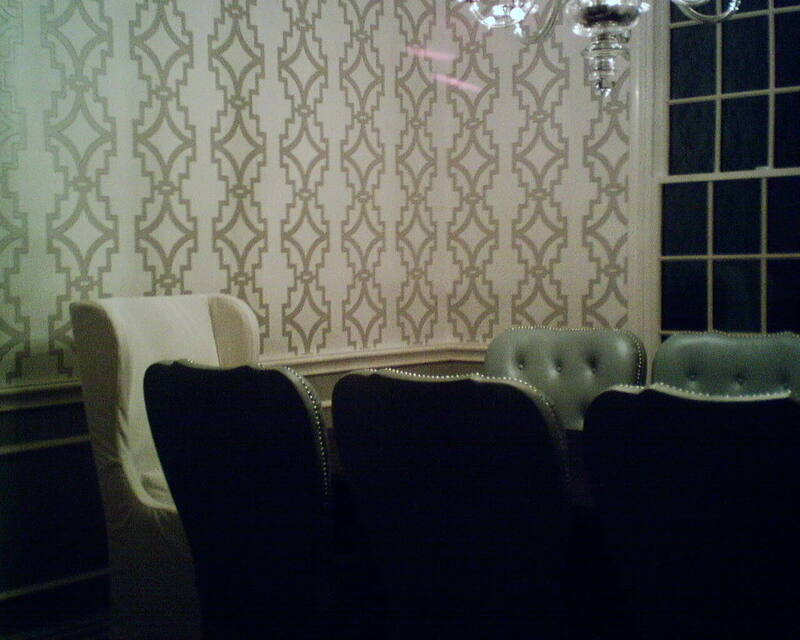 The dining room was finished in time for Thanksgiving dinner the next day! More white wallpaper! This young family has a fairly traditional styled home in West University Place, but wanted a more modern feel. They had originally selected a geometric pattern with 6″ circles. But when I got to work, they had switched to this silver-on-white trellis. I think this works MUCH better. The room retains its traditional elements – crown molding, paneled wainscoting, hardwood floor. A crystal chandelier was added, but it was carefully chosen to straddle the line between traditional and modern. 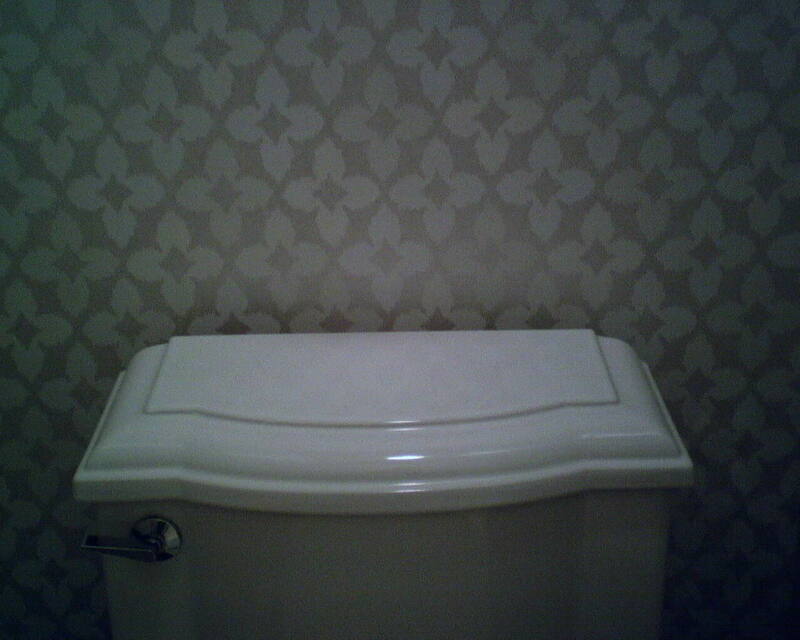 The original circle wallpaper pattern would most likely have been too contemporary. This trellis does a perfect job of blending traditional with modern, and pulls all of the room’s elements together. 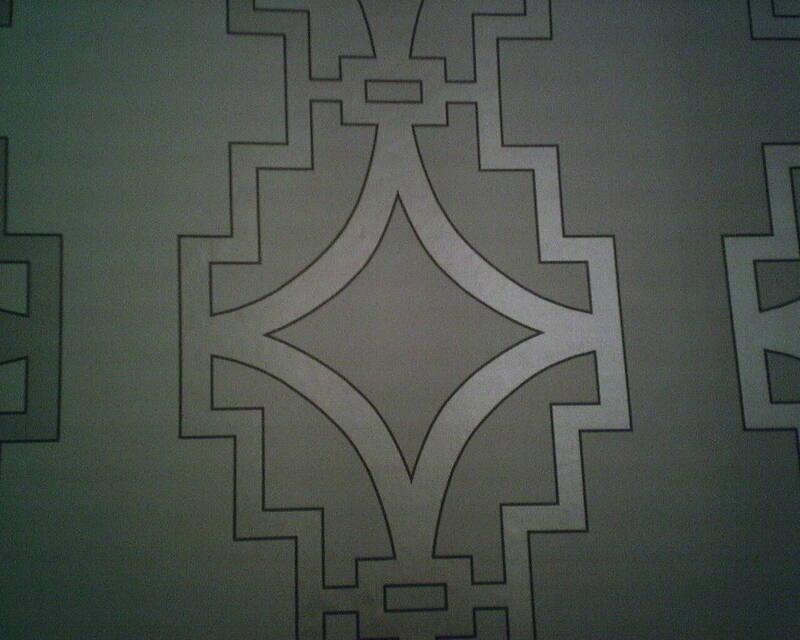 From a paperhanger’s point of view, I was happy that the pattern motif did not cross the seam line. Meaning that I did not have to match one strip to the next, and so could manipulate the strips so that the exact same part of the design hit the top of the wall on every strip, maintaining a uniform look. 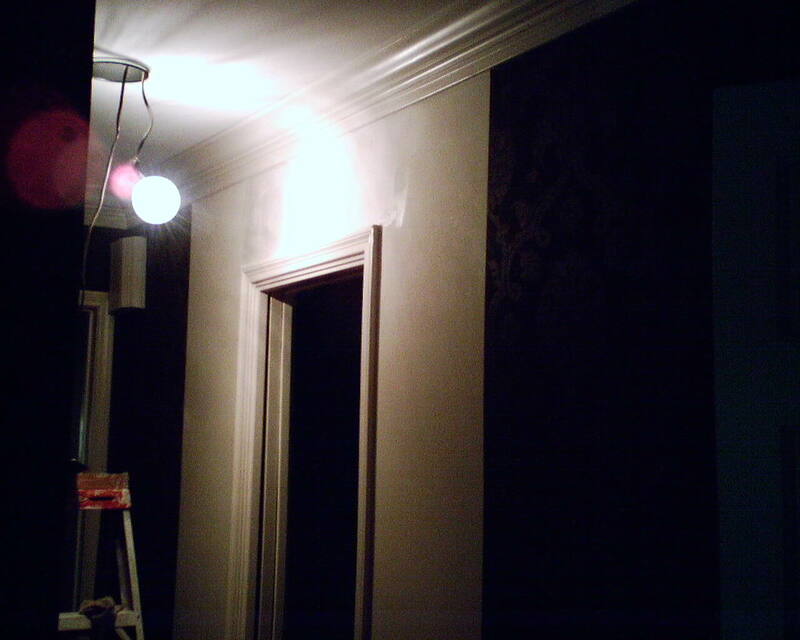 That helps a lot when a room has unlevel ceiling and wainscoting lines, and unplumb corners. Wonder Why I Inisit On Doing My Own Prep? 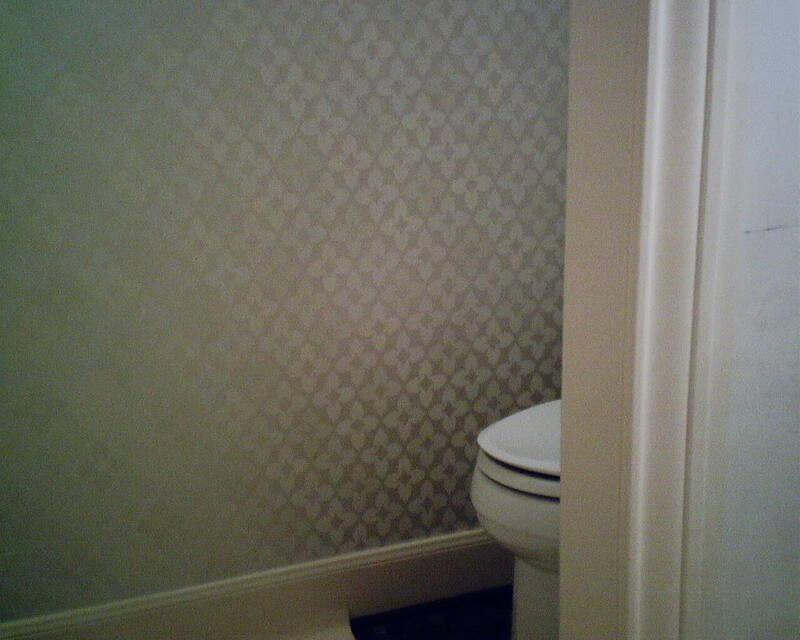 The painter told the homeowner he had made the walls “smooth and ready for wallpaper.” He charged her for this mess, too. Guess who had to sand, refloat, sand again, and then prime? But you can bet I got that wall looking great! Moral: No matter what the contractor or painter says, the WALLPAPER HANGER is the correct person to prep walls for wallpaper. Last week I attended an open house at Modani, a national chain of modern furniture stores, with a location on Westheimer near the Galleria. http://www.modani.com/ An interior designer I work for, Pamela O’Brien, of Pamela Hope Designs, was one of the hosts. Besides the wine and cheese 😉 , we browsed around the store, looking at home furnishings, and then the store owner and the interior designer gave a short talk – about furniture, colors, trends, etc., followed by Q & A. I think about home décor in terms of wallpaper, naturally. But it was fun to hear other points of reference, both interior design and furnishings. ALL of the furniture, light fixtures, accessories, artwork, etc. at Modani are contemporary in style. Interestingly, EVERYTHING is either black, grey, white, brown, clear, or chrome. They have a (very) few accent pieces in other colors – really BRIGHT colors – and, let me tell you, when you have a neutral, monochromatic setting, and place one bright lime green vase on the coffee table, or an aqua bowl on the night stand, it REALLY pops. Of course, me, being a wallpaper hanger, I had to look beyond the furnishings to the backdrops – the store had some amazing walls that looked like stone, clouds, leather. (Check their website.) They look three-dimensional. 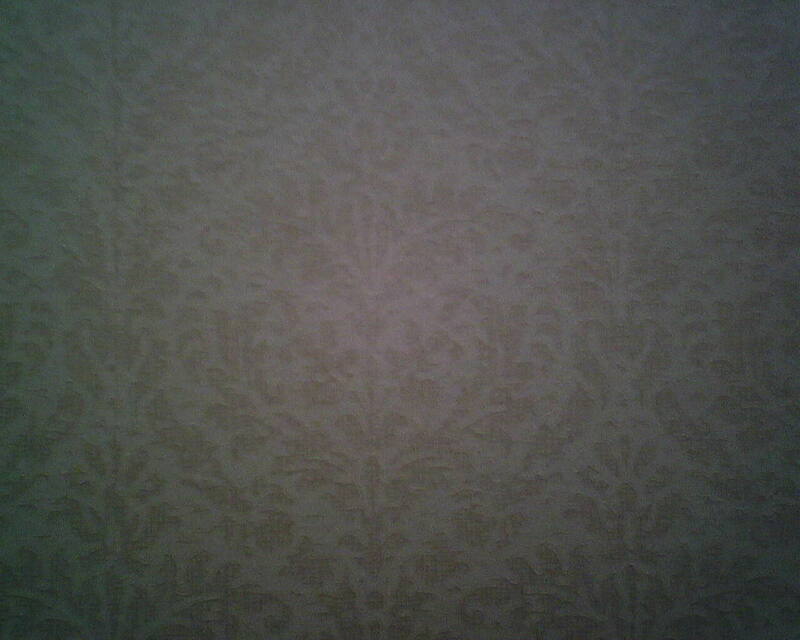 But when you got up really close, you could see that these walls were wallpapered. Some were custom-made digital graphics. Others were regular wallpaper, and the store had the selection books sitting out in the room setting so you could leaf through them. 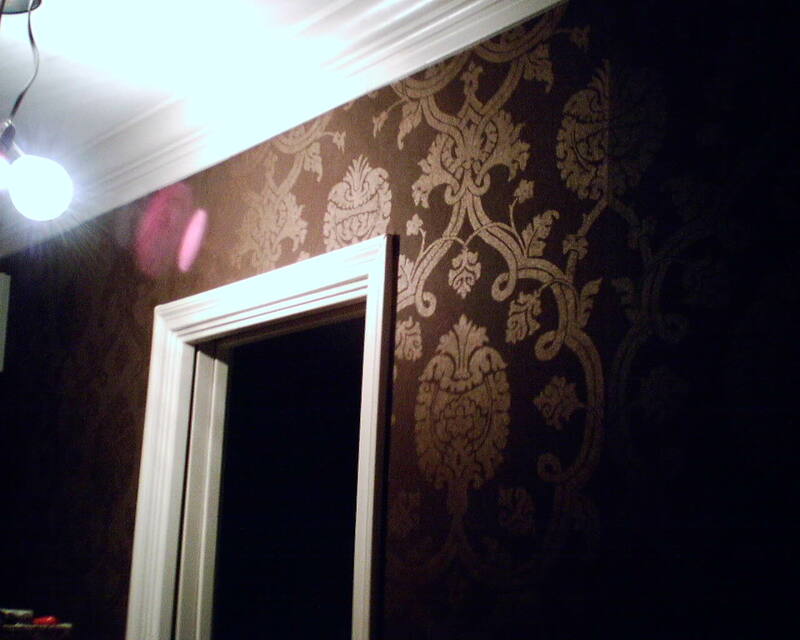 Plain, old, regular, not-exotic, not-expensive wallpaper, that anybody could purchase and use to really dramatize a room’s backdrop. 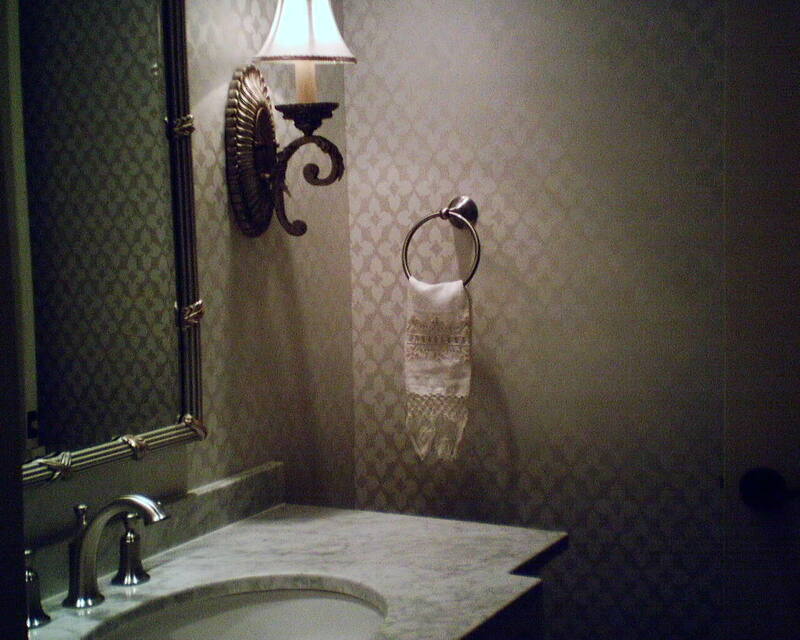 Fifteen years ago, I hung the natural colored grasscloth you see in the first photo, in the powder room of a townhome in the Montrose neighborhood of Houston. It has held up perfectly all this time. 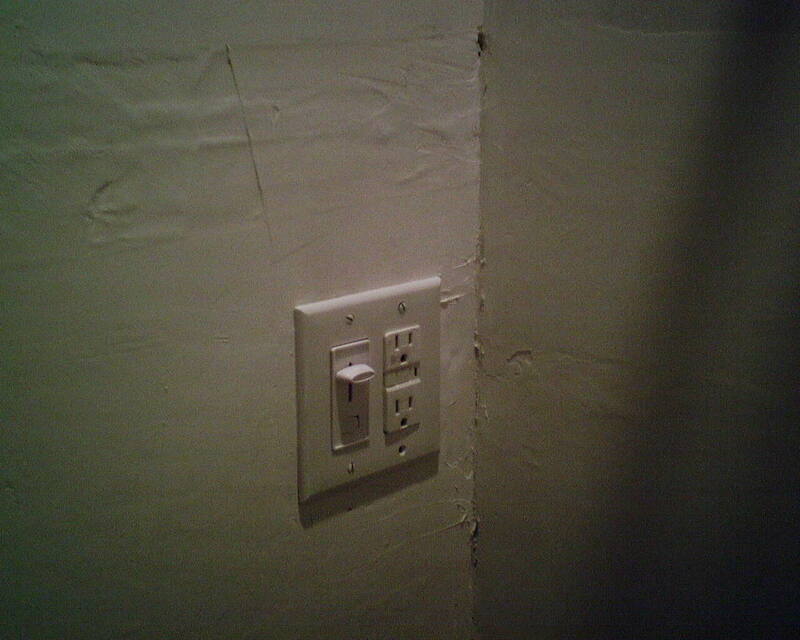 But the homeowner wanted an update. 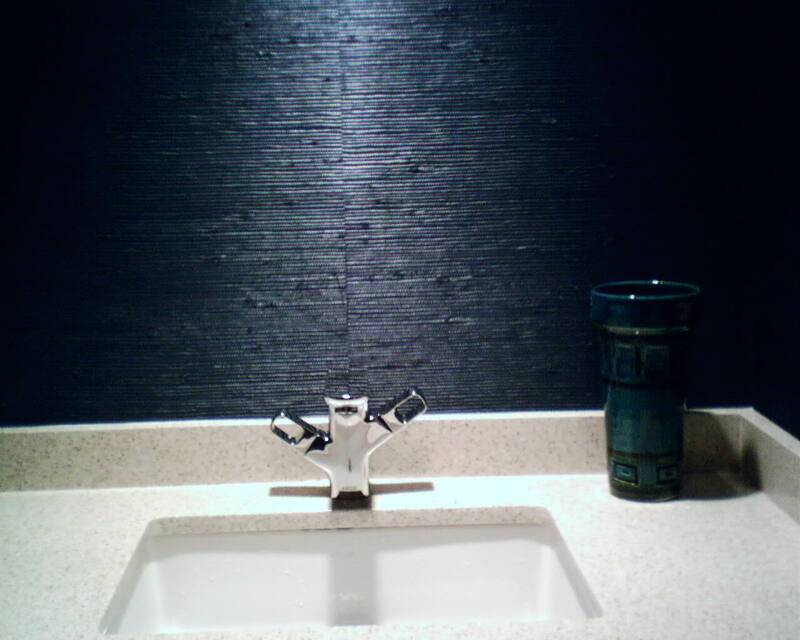 He had a new vanity installed, in dark stained wood with a white quartz countertop. He fell in love with the idea of navy grasscloth, and researched many brands, ordered samples, and finally settled on this one by Seabrook. I was very pleased with his choice. It was thin(ish) and turned corners well, it trimmed nicely, and there was no paneling or shading (difference in color from strip to strip, which is pretty common in many brands and colors). It was not color-fast, however, and the blue ink came off on my hands (sorry, no photo). I had to keep my hands absolutely dry, and had to “work clean” to be sure no paste got on the surface, because it would have been impossible to wipe any paste residue off the surface without causing blotching or having some of the dye lift off the surface. In the second photo, I have stripped off the top grass layer of the material, and have soaked the paper backing. Once the old paste reactivated, this tan paper backing came away easily, with no damage to the surface underneath. That’s because I used a wonderful primer, KILZ Original, an oil-based product. 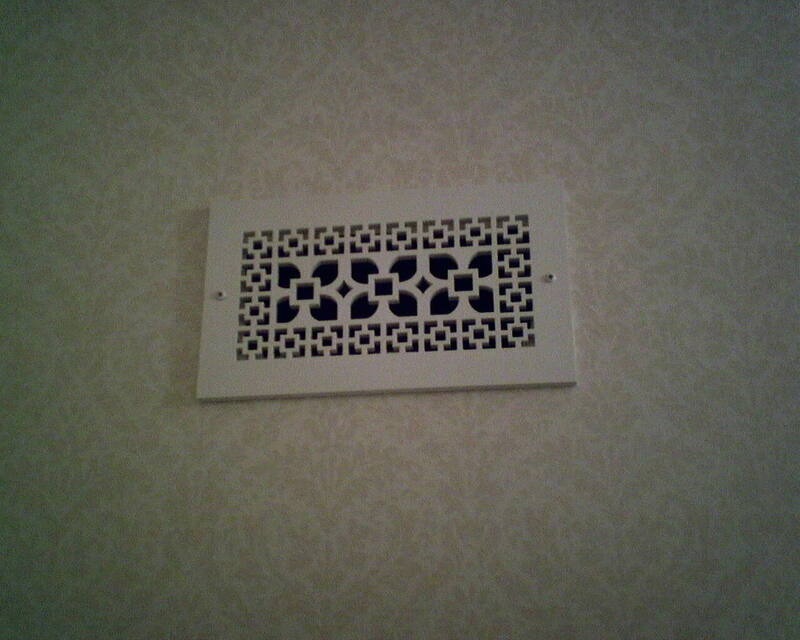 It has terrible fumes, but it works really well under wallpaper. 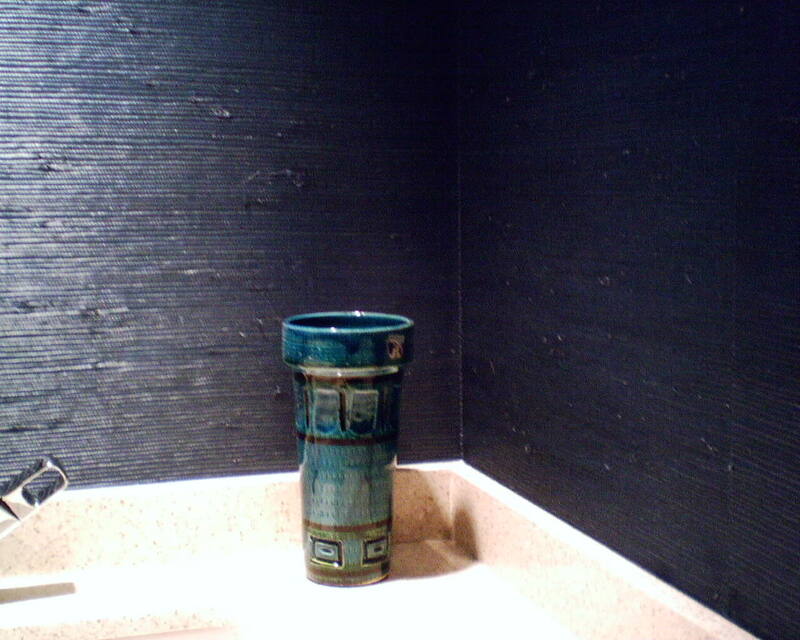 The next photos are shots of the new, navy blue grasscloth. You are currently browsing the Wallpaperlady's Blog blog archives for November, 2014.